NGOs may RSVP until 20 February 2013. Violence Commited in the name of "HonoUr"
NGOs please RSVP by 26 February at the latest. Permanent Mission of Finland (reception), 866 UN Plaza, Suite 222 (2nd floor). Monday, 4 March, between 9 and 10 am. Please note that due to space limitations an RSVP is required with name, organization and email to Carina.Alm[at]mfa.no in order to attend. No Special Event Tickets (SETs) are required for this event. IMPORTANT NOTICE: Kindly note that an RSVP or a UN Badge is required to access the premises . Please send your full name as on your ID to protecting.women.and.girls[at]gmail.com for RSVP by March 1. At the Swedish Mission to the UN. Thank you for your interest in our side event . Please let us know the names of the colleagues in your organization who will be attending. Please include in the subject of your email the title of the side event you wish to attend. 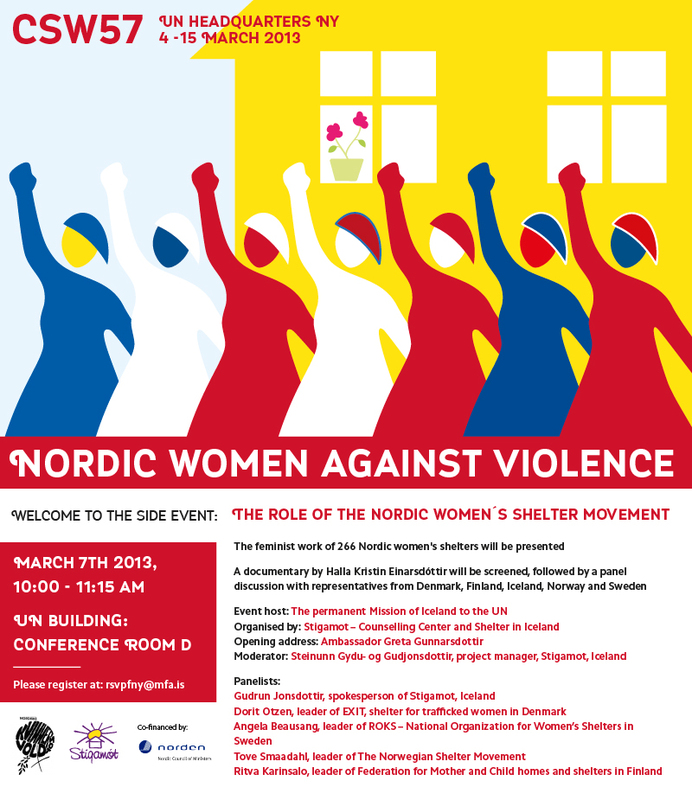 Please rsvp for side event tickets by 4 March noon time. General Assembly lobby, 5 March from 4.15pm to 4.45pm at the side event ticket table. Please rsvp for special event tickets by 4 March COB. General Assembly lobby, 6 March from 11am to 11.30am at the side event ticket table. 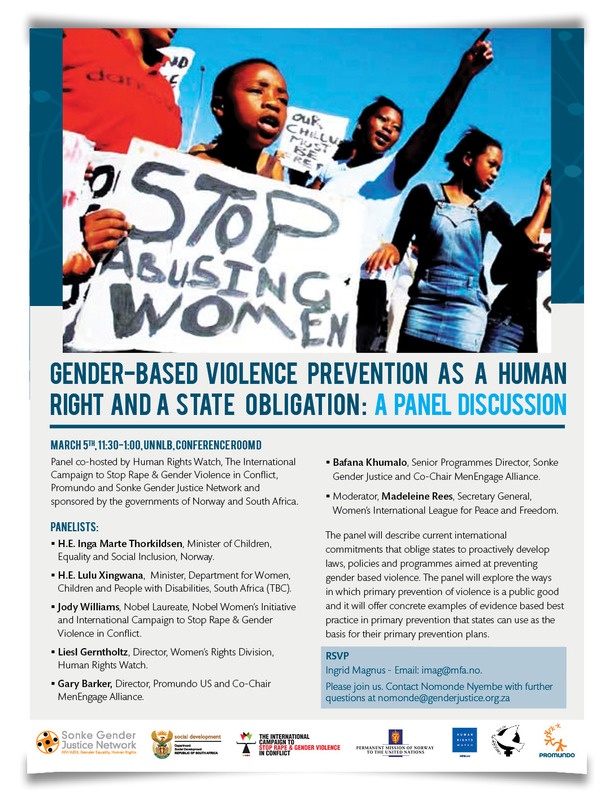 From prevention to response- Engaging men and boys in the elimination of violence against women and girls. Unfortunately, we have no more tickets for the event. Ticket pickup information: General Assembly lobby (side events ticket desk), 6 March, 12:30 PM - 1:30 PM for confirmed tickets. 1.30-2.00 PM for wait-listed participants. Thank you for your interest to the side event of the Working Group on Discrimination against Women in Law and in Practice. Please let us know the names of the colleagues in your organization who will be attending. Please include in the subject of your email the title of the side event you wish to attend. General Assembly Security Check (46th Street Entrance), 7 March, 7:30 AM to 8AM. Cartas de Mujeres: An innovative and inclusive awareness campaign to prevent violence against women and girls. Confirmed guests have been emailed instructions for ticket pick up at the Permanent Mission of Ireland to the United Nations. For those registered, tickets for this event can be picked up in the GA Hall two hours before the meeting, i.e. from 11am to 1pm, on Thursday 7 March. Observers and guests cannot attend the event without the ticket. General Assembly Lobby, 7 March, from 11.30 to 1.15pm at the side event ticket table (please arrive at least 30 min in advance). Confirmed guests have been emailed directions for ticket pick up. Leaders Speak Out: Elimination of Violence Against Women and Girls in the Pacific – from Research to Implementation. For International Women's Day, UN Women launched its theme song "One Woman". Come sing karaoke with us, and show that you are the next YouTube star! If you would like to reserve a ticket for this side event please write to: chetpon.changcharoen[at]one.un.org Tickets will be issued on a first come basis. General Assembly lobby (side events ticket desk), 8 March, 10:00 AM. General Assembly lobby (side events ticket desk), 8 March 2013, 2:00 pm. Closed event: Confirmed guests have been emailed instructions for ticket pick up at the Permanent Mission of Ireland to the United Nations. General Assembly lobby (side events ticket desk), 8 March, 2:30 PM - 3:00 PM. What is the price of violence against women & girls? Capturing costs and consequences. 1) Government Delegates and UN staff members are able to enter the North Lawn building and attend side events with their UN grounds passes. 2) ECOSOC accredited NGO representatives require side event tickets (SETs) to attend side events in the North Lawn Building. 3) Other individuals (who do not have a valid UN grounds pass)may also attend side events in the NLB with a SET. We look forward to your participation. Austerity, Fiscal Policies and Economic, Social, and Cultural Rights: Vienna+20 - Where are Women Now? Guests who RSVP-ed may pick up tickets in the General Assembly lobby (side events ticket desk) on 12 March at 11am on a first come first serve basis. United Nations Human Settlements Programme (UN-Habitat), AXIOS-Mision Mujer, A.C. Confirmed guests may pick up tickets in the General Assembly lobby (side events ticket desk), on 12 March at 10:30am. Wait-listed guests may pick up extra tickets - if available - at 11:30am. 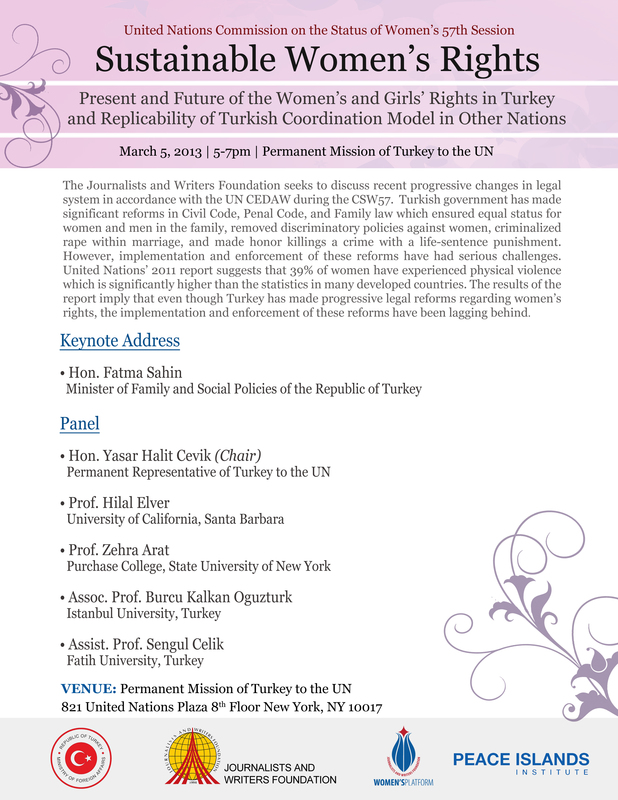 General Assembly lobby (side events ticket desk), Tuesday, 12 March 2013, 11:30 am to 1:00 pm. Women Human Rights Defenders - a Resource at risk? Obligations and practical measures to support Women Human Rights Defenders and protect them from intimidation, reprisals and violence. Thank you for your interest to the side event of the SR on violence against women, Ms. Rashida Manjoo. Please let us know the names of the colleagues in your organization who will be attending. Please include in the subject of your email the title of the side event you wish to attend. The Venue of the Panel is changed from Conference Room 2 to ECOSOC chamber. Thank you for your interest to the side event of the SR on trafficking in persons, especially women and children, Ms. Joy Ngozi Ezeilo. Please let us know the names of the colleagues in your organization who will be attending. Please include in the subject of your email the title of the side event you wish to attend. Panel discussion on the theme "Moving men from Bystanders to Allies"
Confirmed guests have been emailed directions for ticket pick up at the Presbyterian Ministry to the UN at the Church Center.